Uluru, formerly known to much of the world as Ayers Rock, is a giant sandstone rock formation in the southern part of the Northern Territory in central Australia. 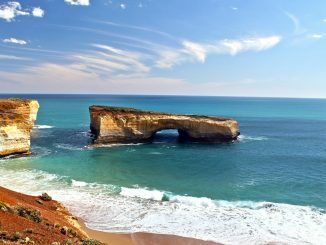 The area around the formation is home to a great deal of watering holes, and springs as well as large caves and ancient Aboriginal paintings. While the Pitjantjatjara Anangu have long considered Uluru a sacred location and called it Uluru, it is also called Ayers Rock to honor the Chief Secretary of South Australia, Sir Henry Ayers who was in office when surveyor William Gosse “discovered” the landmark in 1873. Since 1993 Uluru has been the first feature in the Northern Territory to fall under the dual naming policy where the Aboriginal name and the English name are both used. 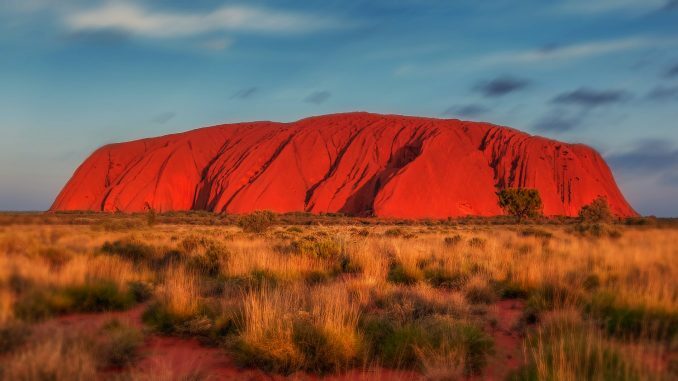 Under the dual naming policy it was originally called Ayers Rock/Uluru but on the 6th of November 2002, following a request from the Regional Tourism Association in Alice Springs the name was changed to Uluru/Ayers Rock. One of Australia’s most recognizable landmarks, and most definitely the most recognizable natural landmark on the continent, Uluru and the nearby Kata Tjuta formation are the most popular sites in the interior of Australia, and Uluru is a sandstone formation and has a height of 348 m (1,142 ft) and a circumference of 9.4 km (5.8 mi). Of the notable characteristics of Uluru is that throughout the day it appears to change color. The deep red glow seen at dawn and sunset are the colors almost always associated with the site. Historically there have been 46 species of native animals known to live near Uluru but according to recent ecological surveys that number appears to be shrinking. The most recent surveys show that only 21 species have been found and that may be a sign of a changing environment. The Anangu people, who are the traditional inhabitants of the area, lead walking tours to inform visitors about the local flora and fauna. 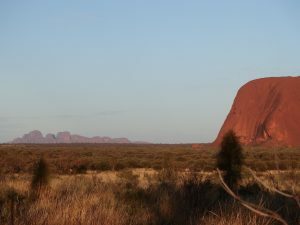 The Anangu have acknowledged that the decrease in numbers has far reaching implication for the condition and health of the landscape. There have been moves to reintroduce at least seven different animals to the site. 25 km (16 mi) west of Uluru lies Kata Tjuta, also called Mount Olga or the Olgas. In order to give tourists the best possible views at both dawn and dusk, special viewing areas with road access and parking have been constructed. Don’t climb Uluru. 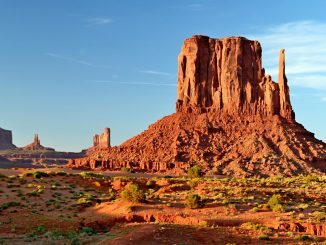 It is considered a sacred place to the Anangu people and is both disrespectful and against the law. If you want the classic sunset photo of the striking vista you will have to get there early and set up a place before anyone else wanting the same shot gets your spot. Don’t spend all of your time looking at the landscape. Because of the limited amount of unnatural light and the low humidity, the stars are likely brighter here than anyplace you have ever been. If taking the summit track is on your life’s list of things to do make sure to schedule a few days. On days when it is extremely hot of in cases of high winds, the summit track os often closed. While at Uluru it is easy to forget about all of the natural wonders just a little ways away. Don’t do this. There are 36 nearby domes that can be explored, and the three-hour Valley of the Wind walk that mysteriously features an almost constant cooling breeze despite the sometimes scorching heat of the region. The best time of the year to visit is from May to September. Because this is widely known it is also the most visited time of the year and despite its size can feel a bit crowded if you are trying to get away from the rest of the world for a few hours. From April to October however it will be hot. Very hot. Since we’re talking about the heat, it’s always a good idea to protect yourself from the environment when visiting Uluru. Take extra water, sunscreen, and something to protect your head from the sun. It’s also a good idea to take something to protect your face from dust swept up by the sometimes strong winds, and your head from the constant beating sun. Uluru is 348 metres (1141 feet) high and its circumference is 9.4km (5.8 miles). Uluru-Kata Tjuta National Park covers a total area of 1326 km2 (512 miles2). The rock is a holy place for the Anangu tribe of Aboriginal people in Australia. They have been living in the area for an estimated 10,000 years. The average geological composition of Uluru is 50% feldspar, 25-35% quartz, and 15-25% mixed rock fragments. Uluru was originally listed as a Natural World Heritage site in 1987 due to its unique geology. 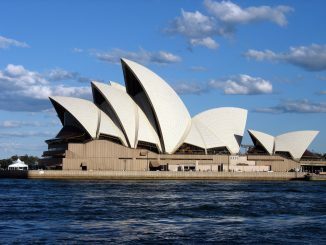 In 1997, it was listed as a UNESCO World Heritage Site due largely to the cultural cultural importance it holds with the Aboriginal peoples of Australia. The rock is one of a very few places in the world to have this dual listing.